Internationally regarded as a thoughtful and compassionate voice for social justice, Randall C. Robinson, the son of Richmond, Virginia school teachers, was born July 6, 1941. He spent three years at Norfolk State College on a basketball scholarship and after service in the military earned his bachelor’s degree in sociology in 1967 at Virginia Union University. Upon graduating from Harvard Law School in 1970, Robinson, with the assistance of a fellowship, worked in Tanzania, Africa. In 1972 he was hired as community development director of inner-city Boston, Massachusetts’s Roxbury Multi-Service Center. Three years later he was staff assistant to Missouri Congressman William L. Clay, then staff assistant to another black Congressman, Michigan’s Charles C. Diggs. Deep concern about the racial situation in South Africa, and the government’s disregard of black nations generally, heightened attention to foreign affairs in the Congressional Black Caucus which ultimately led to the founding of TransAfrica Inc. in 1977, a private advocacy organization committed to influencing American foreign policy toward Africa and the Caribbean, particularly in matters relating to human rights abuses, immigration reform, and foreign aid. Robinson, an articulate and dynamic spokesman, was the most prominent and effective activist in the fight against South African apartheid, persuading Congress to pass an anti-apartheid law in 1986 overriding President Reagan’s veto, and helping to achieve the release of Nelson Mandela from prison. 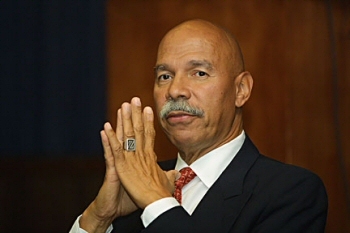 In 2001 Robinson stepped down as president of TransAfrica. The author of four books, including the bestseller Quitting America: The Departure of a Black Man From His Native Land (2004), Robinson lives on the Caribbean island of St. Kitts.